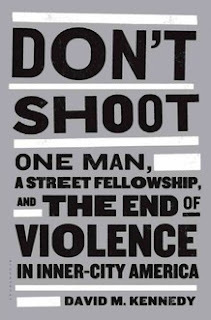 Recently Peoria Mayor Jim Ardis announced that a new anti-gun violence initiative will be centered around a concept found within the book, "Don't Shoot" by David M. Kennedy who was instrumental in what has been called "The Boston Miracle" which significantly lowered street level homicides in the Boston area in 1996. The program is similar to the Drug Market Intervention (DMI) program which Peoria adopted in 2009-2010. The DMI was conducted in a 8 block radius on Peoria's South Side. The DMI involved an undercover sweep of those who sold drugs. The nonviolent offenders were given a second chance at life, told that their record would be purged if they didn't re offend but that they would be in double trouble if they continued to be part of the problem. There were a host of persons taken off the streets who went to jail to serve time because their records and criminal history did not qualify for the second chance. 9 persons were extended a second chance. 7 of them remained non-offenders with many of them going on to complete their education or undertaking gainful employment. During the time the DMI zone experienced a marked lower rate of drug sales activity and violent crime. While the same activities in other areas, even adjacent to the DMI zone, was generally higher. Within the DMI zone there was greater neighborhood involvement and the DMI zone community rallied around the idea of a better and more safe neighborhood. As you will note this strategy contrasts to "Broken Windows". up until this point "Broken Windows" was a strategy adopted under Peoria Police Chief Settingsgaard. We have been passionately against the broken windows strategy claiming that it has actually contributed to the rebellion and does not lead to community stability. This particular approach appears to be one which involves the community and creates layers of accountability which we believe is a much better approach to create and facilitate sustainable change and improvement within the community. Community involvement was always a part of the DMI effort, but these things were not set in place until after the DMI sweep and until almost 6 months after it was determined that there would be no additional drug sweeps in the same area. This was a problem. There was no plan for the community element and a plan had to be developed on the fly and volunteers such as myself and neighborhood association leaders such as LaVetta Ricca were expected to expand upon their already busy schedules to implement what would become yet another neighborhood association. Eventually the community meetings would fade out due to lack of participation, no funding and no staff to carry out community tasks and duties. Because there was a lack of funding and low preparation for the community assets and involvement, the neighborhood portion of the DMI slacked off. Frankly speaking, when the DMI grant dried up, many of the agencies and persons associated with the effort could no longer participate. Some could and would continue because this project was within their job already, but others could not. My question is can we avoid these problems in a new effort geared toward eliminating gun violence and reducing gang offences? Speaking as the former DMI Community Leader and one who has experienced the problems encountered first hand, a sustainable and funded program is what is necessary in order to address this problem. Within Peoria, violence is only a problem when it occurs. Community leaders and assets should be involved, but if there is funding from grants, community participation and participants should be made receipients of funds as well. Here's is another key to solving the problem of crime and violence within Peoria that officials have not considered as well as they should in my opinion. In my next post, I'll deal with the exposure of a City recidivism plan that I personally proposed to Peoria Police Chief Settingsgaard in 2008-2009 which was met with disregard. In 2012, we need everyone involved to step up to make this a better community and to address the issues that we face.